Recently in Europe Nissan and Sony have been running the GT Academy, a competition challenging GT5 experts to take part in a massive online tournament and race each other in GT-R supercars specially rendered for the event. 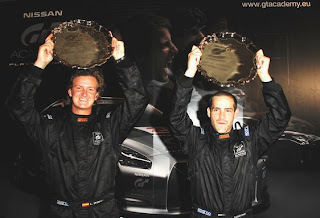 However it wasn't the gaming that set this competition apart, but rather that at the end 22 finalists were invited to Silverstone for a real-life GT Academy race preparation course. And now after a weeklong competition, Nissan is finally crowning two overall winners of the massive event. Their grand prize? Entry in a four-month training program for Nissan, with the chance to drive in (no really) the Dubai 24 hour endurance race next January. Real cars are a little harder to drive than video games. No reset, no restart.